Ah, last summer the weather was ridiculously warm, lasted for weeks, and in the process – made lots of lawns very, very dry and drought stricken indeed. We’ve had lots of phone calls, emails and messages from our customers wondering what they can do to get their drought damaged lawn back to its best for 2019, so we prepared this fool-proof four step plan of preparing, aerating, feeding and overseeding. The best chance your lawn will have of a fresh start and new growth will be with a fine seed bed. What does a fine seed bed entail? To get a fine seed bed you’ll need to first remove all debris – stones, weeds, leaves, from your lawn. Then you’ll need to dig and turn over your soil about 5-10cm deep and then give it a good rake. This gives you the best foundation for sowing new seed and will kickstart the renovation and regrowth of your lawn. Drought weather means usually moist lawns are devoid of any kind of water / rain intake, and this allows the soil to become compacted. 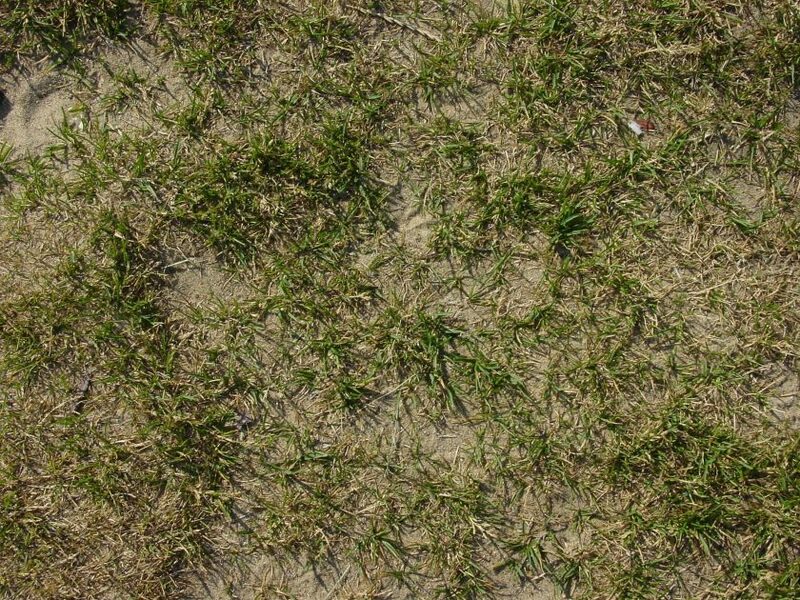 Compacted soil makes it very difficult for any grass seed to grow, as it isn’t getting any of the nutrients or water it needs. To help your soil out, spike your lawn with a pitch fork to alleviate the compaction then leave it for a few weeks to let the soil cultivate on its own. If you’re super fancy and have a corer, you can use this too. When the soil is left on its own to cultivate, some spare weeds may pop up. This is to be expected as the soil has been disrupted and is basically trying to figure it’s new found airiness out. Pull any of these weeds out by hand – don’t use a weed killer. By now, your lawn will have had lots of rain or been watered by you since summer 2018 as we are back in the swing of ‘normal’ UK weather – a.k.a rain every other day! Your soil will be moist enough to spread a nitrogen rich fertiliser to kick start its growing, and greening! We recommend our SLOW RELEASE: Spring / Summer fertiliser for any established / existing lawn. A continuous feed for up to 4 months, this fertiliser will strengthen the root growth of your existing grass while feeding the soil for new grass to grow up big and strong. Spread at a rate of 35g per m2. You can do this by using your hand if you are wearing a glove, and by using a hand held or rotary spreader. Not sure of your spreader settings? Make sure to contact the manufacturer who will be able to tell you the right setting for your fertiliser and area you are fertilising. Make sure to water your fertiliser after you have spread it, as the water will not only help the soil absorb the fertiliser but also help it to activate and work its magic. Or eh… science as well call it here. We recommend waiting two weeks for the fertiliser to take full effect before you plan to sow. Make sure the weather where you are is forecast as 10 degrees and up for the next two weeks in the window you are planning to sow in, as these temperatures are what grass seed needs to germinate. Sow your seed just like your fertiliser at a rate of 35g per m2, and ensure it is covered up to £3 coins deep i.e. – just under the surface. Rake over, firm down with your feet in your best penguin shuffle and water. Water your overseeded lawn like a brand new one and don’t mow until the blades are at least 5cm in height – close mowing or early mowing can damage new seedlings who are just trying to find their way in the world. Ok, so no one (apart from maybe meteorologists) could have predicted such a long hot summer in 2018 – but if there’s another one in 2019 (fingers crossed) prevention is always the best cure and will stop the good work you do now from being undone. Invest in a sprinkler, or make sure to water your lawn in-between sunbathing sessions to prevent it from becoming dried out and compacted. 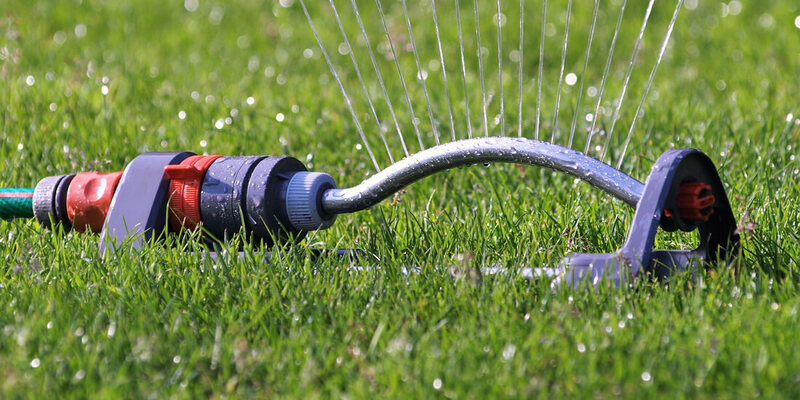 Just as we need to stay hydrated in unlikely hot UK weather, so do our lawns!